Nevis may be smaller and sleepier than its sister isle of St. Kitts, but the capital of Charlestown has a decidedly more elegant and old-fashioned vibe than the rough-and-tumble neighboring capital Basseterre. The local code of conduct seems like something from a bygone era, where everyone smiles and stops to say good morning, afternoon or night, depending on the time of day, and public displays of swearing or complaining are frowned upon. Walk along Main Street to the waterfront and visit the Museum of Nevis History to learn about the island and its most famous inhabitants, Alexander Hamilton and Horatio Nelson. Along Government Road, you can find a Jewish cemetery with headstones dating from 1684. And just a short walk from downtown takes you to Pinney's Beach, which boasts three miles of soft, palm lined Caribbean sands, along with the Four Seasons Resort and smattering of beach bars. Charlestown is the capital city of Nevis. It sits on the western shore of the island, about eight miles from the Vance W. Amory International Airport and five miles from the Sea Bridge ferry terminal that connects Nevis with neighboring St Kitts. 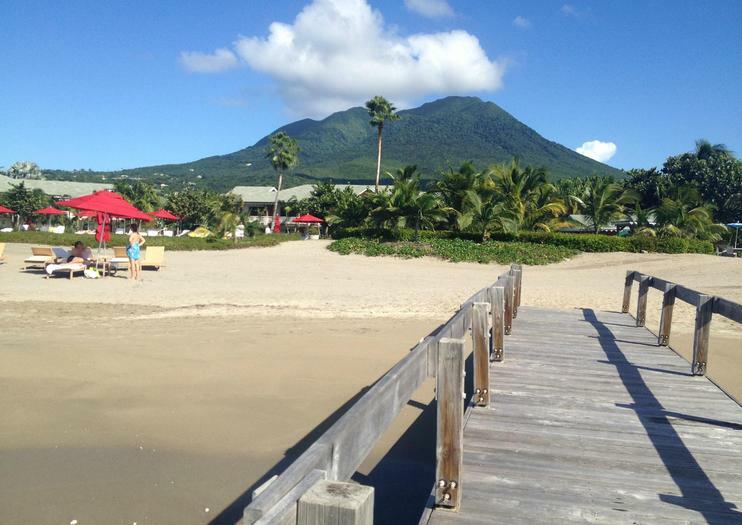 Pedal around the entire island of Nevis during this cycling tour for experienced riders. Follow your local cycling guide for 2 hours of strenuous biking, conquering the island's famous hills: 'Killer Bee' and 'Anaconda'. Along the way, learn about the island's history and culture and get stunning views out over the ocean from hard-won vantage points. Use of bicycle and helmet is included. Set out from St Kitts for a full-day exploration of neighboring Nevis, one of the Caribbean's most laid-back and unspoilt islands. Embark on a guided island ferry tour, stopping at the historic Old Bath House—believed to be one of the region's first tourist hotels—and the Museum of Nevis to learn about local boy Alexander Hamilton. Later, discover former plantations-turned-resorts, stroll the grounds of the Botanical Gardens and marvel at the island's towering extinct volcano. Grab lunch on your own before catching the ferry back to St. Kitts. Explore the old sugar plantations and defunct rail beds by bicycle during this cycling tour on Nevis. On this 2-hour tour, pedal your bike through the villages of Fountain, Camps and Newcastle with a local guide. Learn about Admiral Nelson and Alexander Hamilton's history on the island and step back in history with a visit to the Nisbet Plantation. Relax and enjoy provided refreshments on several pit stops along the way. Bicycles and safety equipment are provided. Take a comprehensive tour of the highlights of Nevis during this 2.5-hour guided excursion. Visit the famous thermal springs to learn about their healing properties, the Montpelier Estate and Botanical Gardens and the Hermitage Plantation. See the estates dating from the 18th and 19th century that now house Nevis' exclusive inns and hotels. In Charlestown, stop at one of the local museums to learn about the island's history. Round-trip transportation from Nevis hotels is included. Start your day with a quick pre-breakfast bike ride around Nevis. This 1-hour guided tour in the early morning has no set itinerary, and is perfect for those who want to get a little exercise first thing in the morning. Feel free to ask your local guide questions about the island, and enjoy rest stops to catch your breath and take photos before the crowds are out. Use of bicycle and helmet is included.